Oh Pinterest! Why must you tempt me with so many projects? We created a simple and quite small gallery wall recently in our foyer. While Pinterest had some amazing inspiration, we opted for something pretty basic that fits in well with our decor. We used frames we already owned and spray painted a few of them white. I’ll be honest, this wall is definitely not complete yet—I’m considering a few things. First, I would like to add a bright-colored old-school key where you see the tiny little canvas covered with scrapbook paper and I plan to change out the photos with our new family pics this fall. I want to change out the mattes in the Crate and Barrel wedding picture frames. On top of that, I hope to add a few pretty prints. 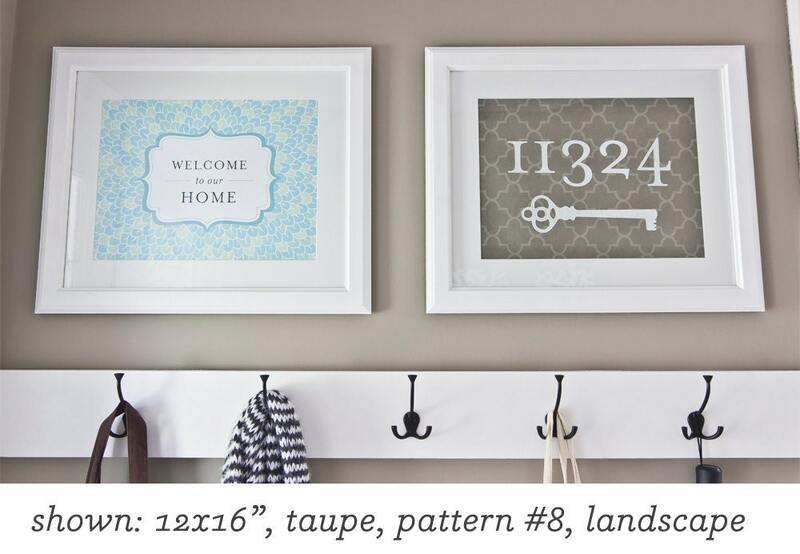 I LOVE this house number print from Jenna Sue Designs on Etsy. I am considering painting a few or all of the frames colors! What do you think? Please weigh in because I’m really unsure right now. You can see that a few of the frames have simple scrapbook paper in them. It just adds a nice pop. Here is how I put the wall together. This looks ridiculous and was taken with an iPhone, so the photo quality isn’t the best, but it shows how simple it can be to get it right if you use paper, or in my case, scraps of paper, magazines and whatever else I could find when we still had all of our good paper in boxes. I’m also embarrassed that you can see my 8-year-old boy handwriting! It’s terrible. Again, I could really use your thoughts on whether or not to leave the frames or to add color. I guess it depends on what the new photos look like, huh? But I could always add black and white pics so yes, please let me know! Just to be transparent, I’m not compensated for mentioning where my frame is from or showing the Etsy print. These are just a few items I like. I’ll be sure to let you know when I receive compensation so it’s completely transparent to you, my dear readers! Anytime you don’t see a disclaimer at the top or bottom of my posts, I am NOT compensated. 2 Responses to "Our quick and easy little gallery wall"
Looks good! I love gallery walls. What color is your foyer? (Sorry if it’s mentioned somewhere else I just found your blog!) We are repainting our living room and hallway and are trying to find a good color! Hello Linds! Thanks for stopping by! Our walls are Sherwin Williams Mindful Grey. It’s a warmer mid-tone grey. It works well for us!